Description: Trees, mallees or shrubs, often forming an underground lignotuber in many species; bark persistent (`rough barks'), or partly or wholly regularly shedding (`smooth barks'). Leaves dimorphic; juvenile leaves opposite; adult leaves usually disjunct opposite (appearing alternate); similifacial or less commonly dorsiventral, oil glands usually present in leaves. Inflorescences usually based on condensed dichasia, forming umbellasters, mostly solitary and axillary but sometimes aggregated into compound terminal, pseudo-terminal or axillary structures; individual umbellasters usually 7-flowered, but ranging from 1 to >30 flowers in some species. Calyx and/or corolla fused into a calyptra which persists to anthesis. Stamens numerous, usually in several continuous whorls; anthers versatile or adnate, dehiscing by separate or confluent slits or pores. Ovary half-inferior, 2–7-locular, enclosed by hypanthium except at top; ovules numerous, ovulodes present. Fruit a capsule, becoming woody in most species. Distribution and occurrence: World: >800 species, all but 16 spp. endemic to Aust. (10 spp. native, 9 spp. N.G., Indon., Philipp. ), all States (c. 240 spp. in N.S.W.). Refs Brooker (2000), Chippendale (1988), Hill (1997a & b, 1999), Hill & Johnson (1991, 1995), Hunter (1998b), Hunter & Bruhl (1999), Johnson & Hill (1990, 1999). Species of Eucalyptus dominate most plant communities in all but the wettest, coldest and driest parts of the continent. Many species are economically of great importance within Australia as timber, nectar resources for honey production, and for shelter in agricultural and pastoral regions. Species are extensively planted world-wide for timber, fuel, essential oils and pharmaceuticals. The eucalypts show a wide diversity, yet individual species are frequently finely defined and difficult to differentiate. Active taxonomic and morphological study in the group is proceeding, and many species remain to be defined. Generic and infrageneric relationships and limits are also under review. A summary and bibliography are presented by Chippendale (1988). A recent classification by Brooker (2000), formalises many of the names of Pryor and Johnson (1971) for infrageneric taxa that had not been formally published. However, species in this treatment are arranged in natural groupings in the text, following Pryor and Johnson (1971) and subsequent modifications of that system, not that of Brooker (2000). Bud and fruit development in Eucalyptus. A, bud with outer calyptra shed before inner calyptra; B, longitudinal section of bud 'A' after outer calyptra has been shed; C, fruit formed from bud 'B' showing calyptra and staminal ring scars, raised disc and exserted valves; D, longitudinal section of bud with calyptra shed as a single unit; E, fruit formed from bud 'D' showing calyptra and staminal ring scars, depressed disc and enclosed valves. 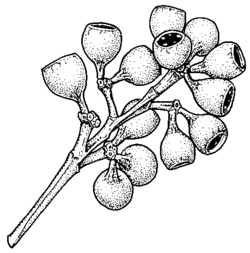 69 Shrubs and mallees; branchlets glaucous Eucalyptus boliviana ms.
Fruit conical to pyriform, 5–9 mm long, 4–6 mm diam. Juvenile leaves not hairy; fruit 2–10 mm diam. Buds acute; fruit <8 mm diam. Fruit usually <6 mm long and 6 mm diam. Fruit <6 mm in diam.